It doesn’t matter if you’re boarding a plane or just visiting that nearby café or festival, while you’re packing your essentials, don’t forget to include the new Chipolo Classic Fruit Edition. Time seems to pass differently in the summer, and all this extra daylight just makes us restless for some fun new experiences. Pack up all your essentials and hit the road in search of new adventures. Just make sure you bring everything back with you by adding a few Chipolos to your most valuable belongings. You can connect your Chipolos to the Chipolo app on your phone and make them ring or check their location on the map in the app when you can’t find them. Or you can use the Chipolos to ring your lost phone, even if it’s on silent. You can even share your Chipolos with your traveling companions through the Chipolo app to double the finding power! And the best part? It has a replaceable battery, so you don’t have to buy a whole new tracker for your next holiday. Just put in a new battery and reuse the same tracker again next year! Chipolo can act as a remote camera shutter too; just open the phone camera in the app and double click your Chipolo. Use it as a wireless selfie stick and take the perfect selfie without having to compromise how many people are in the photo or how much of your background you can include. Forget strange angles because your arm wasn’t long enough and say goodbye to feeling self-conscious whipping out a selfie stick every time you want to take a photo. And here’s the best part – Chipolo can take a photo as long as it stays connected so you can play around with your photography skills from as far as 60m! If your phone can come in wonderful bright colors and cases, why not your Bluetooth tracker? 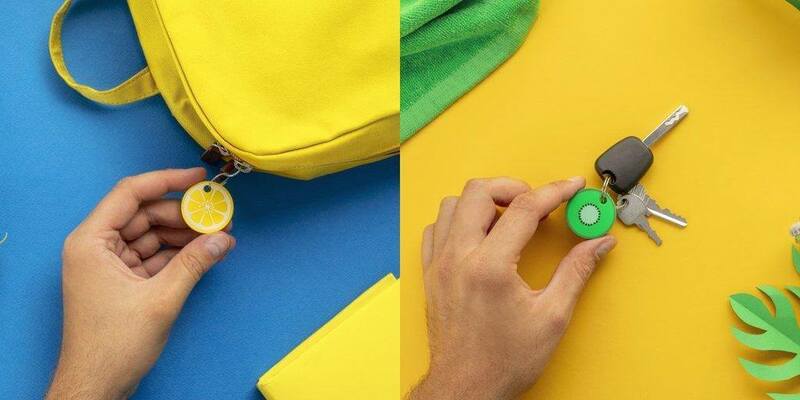 Use it to compliment your essentials or your outfit with a delicious pop of color that will catch everyone’s attention and keep track of your things no matter where you end up. But it’s not just about how it looks; after all, who could miss a bright spot of color in a sea of white and black?